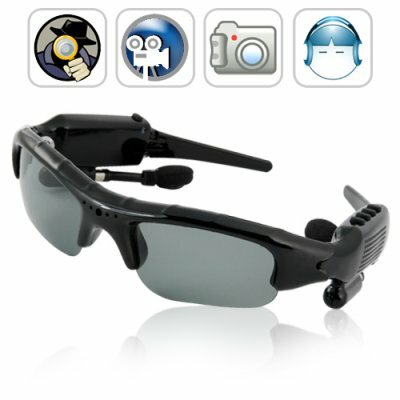 Successfully Added Espionage - Camera Sunglasses (4GB, DVR, Bluetooth, MP3) to your Shopping Cart. in style with the Espionage sunglasses. The Espionage glasses let you record high quality videos, take beautiful photos, and even listen to your favorite MP3 tracks, all from the convenience of a pair of these stylish sunglasses. This is the perfect solution for people looking to record undercover video in the field, or simply anyone who wants to have a little fun and document their daily adventures. The pinhole lens is virtually undetectable so you can wear these glasses everywhere you go and no one will ever suspect that they are being recorded! The sunglasses come with an impressive 4GB of memory so you will have enough storage capacity to capture hours of high quality video and audio, or you can even load your favorite MP3 music files for listening to when your not ing on unsuspecting people. If that wasn’t enough, the Espionage glasses even come with Bluetooth connectivity for hands free cellphone communication when paired with your mobile phone, as well as a FM receiver for listening to your favorite radio broadcast while you are out and about! The Espionage sunglasses come with high quality polarized lenses so you can wear them all day long and without any strain or discomfort to your eyes that you would find with cheaper non-polarized lenses. The ear buds are fully adjustable to fit perfectly to your ears, making listening to MP3s or FM radio more convenient than ever, and the Oakley inspired all black design is perfect for any formal, informal or casual occasion. With all the uses these convenient glasses have to offer its hard to imagine a better all-in-one device at such an incredible price. Place your single piece or bulk orders now while this versatile product is in stock and ready for immediate shipping. The Espionage sunglasses are brought to you by the leaders in high-tech gadgets, Chinavasion! Battery life: About 60 minutes continuous recording depending on use. Do these sunglasses record audio? Yes, they records video with audio. Can I zoom with the sunglasses? Want to know more about the latest in personal electronics and digital media products? Do you want to read stories regarding new products before anyone else? Then read our blog at www.chinavasion.com or subscribe to our RSS newsfeed to keep up with what is happening in the world of China Wholesale Electronics. exceptionally quick postage 2days to australia, very comfortable and good sunnies. the video quality is great, mp3 and bluetooth are awesome. on 2010-08-13 03:23:52 incredible & good working gadget .. thnx a lot! my general opinion can´t be better .. much better quality than expected, especially the video recording, userfriendly, sounds very nice as well .. only one problem .. the text with the functions below the buttons get away with whatever humidity, so try to remember the functions before using it .. or better write it down. The instructions are not that good and to differentiate if u have music or video, or if the video is on or off, is sort of difficult, but after a couple of times it works perfectly ;-) Generally speaking, for the price you pay and the multiple good working functions i'd say it's a MUST. I feel like a child with new shoes!! Also many thanks for the quick sending / shipping, very very good. Congratulations!. PS: When video recording move your head slowly to the different targets, otherwise the movie won´t be as good as expected due to your own fault. Then you realize how quick and how often we move our heads when sth calls your attention! Just an advice! Отличный девайс - рекомендую всем! Качество видео, для такой камеры - просто супер! This item is great and useful. Thanks to China vasion for these items and for the fast delivered and a good tracking.